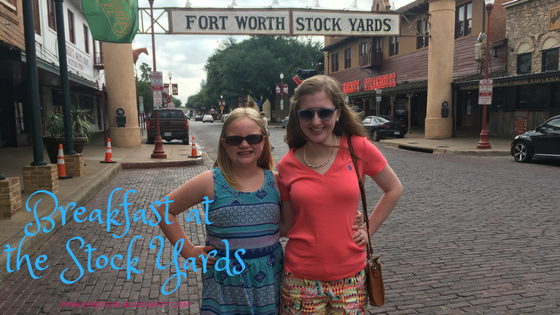 Life as Pink Einstein | Dallas Fashion and Lifestyle Blogger: Breakfast at the Stock Yards! Breakfast at the Stock Yards! I got out of school on May 26 and the next day, my family and I went to the Fort Worth Stock Yards to eat breakfast at this amazing restaurant called H3. They have tons of fun things in the restaurant like saddle bar stools and a buffalo behind hanging out of the wall! It was tons of fun and the breakfast was delicious, I was so hungry that I forgot to take a picture of it before I ate it but I had three flapjacks that were as big as my face, I ended up sharing with my whole family and we still didn't finish them, and a couple of pieces of bacon. Here's the buffalo behind that is hanging on the wall in the bar area! All around the restaurant they have different animals hanging up and other fun things to look at. For my outfit I wore my Crown and Ivy pineapple shorts, my coral Ralph Lauren tee, and my Jack Rogers. My sister wore a pair of brown wedges and an H&M dress. Of course we had to take pictures in front of the sign! Here's a look at what the restaurant looks like from where we were sitting. Here is what the saddle bar stools look like. They were very hard to get on but the idea of them was cool. Overall it was a fun way to kick off summer break and I hope you enjoyed seeing the pictures from our morning!